Specifically Designed for Chemical Injection Applications in Onshore Oil Fields. The Nject Chemical Injection Flow Meter is specifically designed for chemical injection applications in onshore oil fields. Each Nject Chemical Injection Flow Meter is individually calibrated and shipped with a calibration certificate, and a completely sealed integral sensor keeps electronics safe from environmental forces. 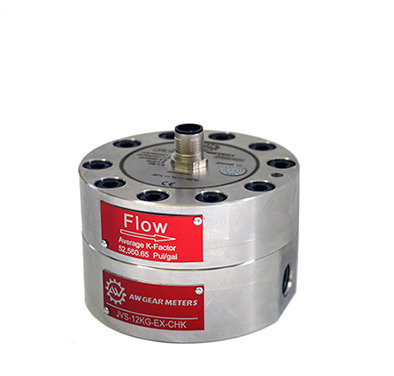 It produces high quality resolution and high accuracy (±0.5% of reading) at low flow rates making it an economical low flow meter for use in onshore chemical injection operations. Each flow meter is individually calibrated and shipped with a calibration certificate. Completely sealed integral sensor keeps electronics safe from environmental forces. The meter produces good resolution and high accuracy at low flow rates, offering an affordable option for onshore chemical injection applications. The sturdy 316 stainless steel construction of this gear meter provides superior corrosion resistance and a longer service life. Assured Accuracy: Each flow meter is individually calibrated and shipped with a calibration certificate. Sealed Electronics: Completely sealed integral sensor keeps electronics safe from environmental forces. Economic Low Flow Meter: The meter produces good resolution and high accuracy at low flow rates, offering an affordable option for onshore chemical injection applications. Rugged Construction: The sturdy 316 stainless steel construction of this gear meter provides superior corrosion resistance and a longer service life. Fast Response Time: This meter can handle short pump shot times (<1 sec) and remain accurate. Works with standard injection pumps from 50 to 200 gallons/day. *Consult factory for other pressures.